Today was largely a driving day, about 225 miles from Ottawa to the Fenelon Falls, Ontario, where we are staying with my cousin at his cottage. We got a relatively early start from Ottawa. One wrong turn coming out of the hotel, coupled with nearby construction work, made our departure unexpectedly challenging but we found our way. Once we got out of metropolitan Ottawa, the surroundings were quite rural; it appeared that much of the area is wetlands. 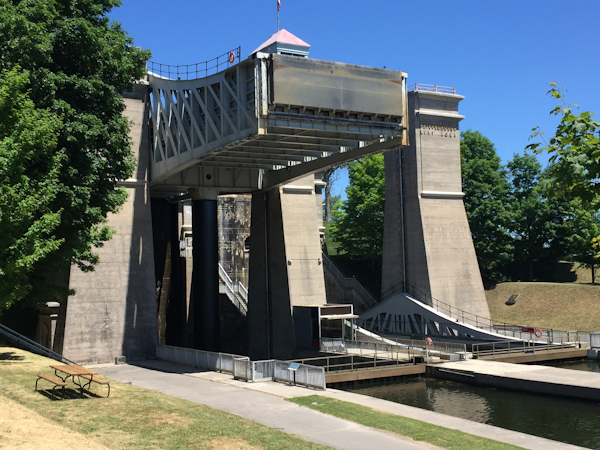 We stopped in Peterborough, the largest city in the area, to see a notable lift lock, one of two in North America and the largest in the world. The Peterborough lift lock is part of the Trent-Severn Waterway system, which runs through much of this area, extending from Lake Ontario to Georgian Bay off Lake Huron. We continued through Peterborough and grabbed some lunch along the way. Traffic was quite heavy, probably because tomorrow is Canada Day. After lunch, we drove to the town of Lindsay, stopping to show Celeste the ruins of the former flour mill where my grandmother had worked about 100 years ago. Lindsay traffic was also heavy, but soon we were on our final leg of the trip to the cottage. Fenelon Falls, Ontario is a village on the Trent-Severn waterway that is primarily a tourist destination for people in the Toronto area. 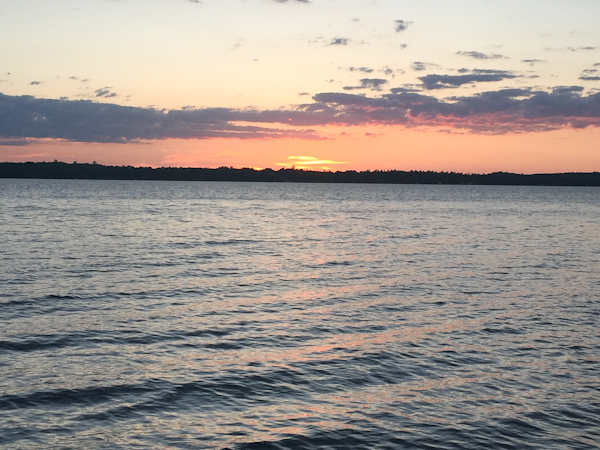 My mother’s family came from Fenelon Falls, and my cousin has a cottage on Cameron Lake that I have been visiting since my childhood. It was wonderful to return to the cottage, visit family, and decompress. After a couple of weeks of shuttling from place to place, primarily in cities, we all needed a breath of fresh air. “OK, it’s official – our families should vacation together!! !”That’s the first thing I thought when I saw this post, Jim! Both our families seem to gravitate to the same sort of sights (aviation museums, railroad museums, we even like cemeteries!) This post reminded me of our detour to Falkirk Wheel (boat lift over the Forth Canal) in Scotland a few years back. More recently, we made a bee line for the Newport Transporter Bridge while visiting Wales! Pretty neat stuff. As usual, **loved** your travel blog, Jim! I should really learn how to do this, esp. for our upcoming trip, where I managed to snag us spots on a tour of the Toyota Mega-Factory outside Melbourne! PS: Thanks for permitting the photos to be enlarged – makes a huge different to my aging eyes!